Anyone who has an Instagram, Facebook or Twitter account would have seen beauty bloggers and influencers post selfies with their cute little faces covered in mud - and their hashtags and brand tags would have pointed you to Facetox. 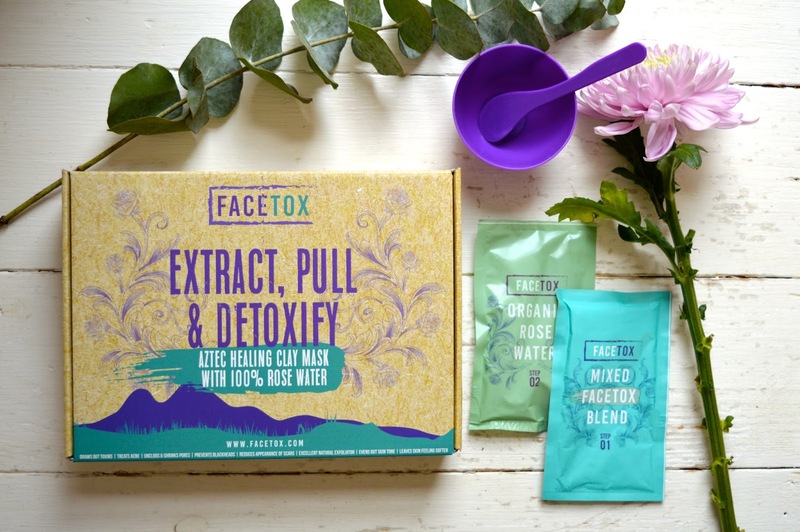 Facetox is a brand who have created an all natural and organic mask made from Aztec clay and rose water. I was approached by Facetox to review the Aztec clay mask and I was really curious to see if it was 'worth the hype' - so here goes! The masks arrived in a cute box that made a big point about being natural and organic - as beauty enthusiasts, we are becoming more and more aware about what goes into our bodies not only through food but also through our skin and brands are keeping up with trying to give us what we want. Facetox boasts several attractive qualities as a product: natural, organic, no parabens, not tested on animals, cruelty free, and suited to all skin types. It ticks all the boxes I would want beauty brands to tick! Inside the box you will find 7 sachets or the Facetox blend (Aztec clay), 7 x sachets or rose water, a plastic spatula and a mixing bowl. You mix the clay and rose water until you are left with a muddy mess - it's super easy and quick to do. Apply the muddy mixture onto skin using the spatula - there is quite a lot of mask mixture, I ended up having some left over, so if you want to invite your best friend for a pamper eve - or test the mask on your SO - then go for it! You leave the mask on for 30 minutes - the perfect pamper if you're enjoying a hot bath, or a cup of hot chocolate catching up with your favourite TV drama. Don't be alarmed - but your skin will tighten and tingle when the mask starts working. What it does is draw out impurities from your pores and minimise them, and like any effective treatment it takes some effort to get to the desired results. My skin felt really tight to the point where it actually creeped me out - not because it hurt or felt uncomfortable, but because it was quite a strong feeling! I ended up Googling a whole load of reviews to make sure I wasn't having a reaction, and came to read that everyone felt quite a strong sensation from the mask. After 30 minutes, you need to remove the clay from your face - the easiest way to do this is to use warm water and a face cloth to buff the clay away. Another point to remember - your face will be red. On the packet it says 'may' be red - there's no 'may' about it. I ended up looking like a true lobster but I was prepared for that after the amount of Googling I have done! The redness disappears after about half an hour, so the best time to apply this mask is before bed so you're not stressing about the redness if you have to go out somewhere. The results? Super soft, glowing skin. I loved how my skin felt after the mask, and how smooth it has been when I woke up in the morning. I have to say I wasn't expecting results as good as the ones I got - I really loved using the mask, it smells nice and earthy, it's a chance to pamper yourself and the results were 10/10. Loved it. Use this mask once a week when your skin needs a pick me up, or the night before an important event so you are left with fresh, clear skin.